With over 15 Million downloads now secured, Hungry Shark Evolution is really starting to motor. Official limited edition plush partner Taymai is also enjoying the ride. If you have seen the charts lately, you will notice the improved sales of Hungry Shark Evolution. The plush has also begun to be featured more prominently as we look to work more closely with all third parties concerned. If you are a retailer looking to enhance your portfolio of game merchandise, you should begin to seriously look at Hungry Shark. What about Summer promotions in store? Nothing better than a shark to engage with is there? Contact us for more information on this growing opportunity. Hungry Shark Evolution… We told you to keep an eye on it. Take a bite? Time to work with us on Hungry Shark? Click to see the latest charts from App Annie. Oh yes, there is a great plush available too. With GDC just around the corner, now is a great time to highlight what is happening with Hungry Shark…. If not, you should. There are a lot of people talking about it. If you have not seen the recent chart performance, we thought we would share some of the visual evidence across the World. Thanks to our friends at App Annie, we have a link for you to view. If you would like to discuss merchandising opportunities around the Shark and Sharks everyone is talking about, please do contact us. Oh yes, 10 million units of the game have now been sold as of Sunday last week. Well it is May 1st so we thought we would lay out an extensive update on WORMS™ for everyone interested in the merchandising program and new opportunities in 2012 and beyond. Firstly, a couple of weeks ago, WORMS™ 2 Armageddon stormed back in to the Top 10 Paid iPhone charts as you can see from the image to the left. This is part of a concerted evolution and indeed Revolution for WORMS™ in 2012 and 2013 with some fantastic new initiatives in progress. Well one of these, as you would have seen from our recent updates concerns the exciting WORMS™ Revolution game that will be available on multiple formats later this year. Earlier this week Team 17 began to introduce some of the new characters. The game features four different classes. Each class plays differently and offers the player different advantages and disadvantages. So, say hello to our favourite, the Heavy! This worm is the largest and most powerful worm in the game, but he’s severely limited when it comes to getting around the landscape and he also makes for the biggest target, meaning he’s easier to hit than the other worms. The Heavy’s size and lack of agility means he’s simply unable to reach the parts of the landscape that the other classes would take for granted without having to resort to a utility, but even then his extra bulk makes him sluggish on the Ninja Rope and Jetpack. However, the Heavy’s extra bulk can work to his advantage as it means he won’t travel as far, compared to the other classes, when hit, meaning he has a better chance of staying on the landscape. Since starting the merchandising program in June 2011, Team 17 and licensing agent AT New Media have been very busy developing not only new games but a merchandising foundation to build on. We are now ready to build with our partners. On the Games side, with the growth of digital sales compared to retail in 2011 and in to 2012, it is important to summarise the number of great WORMS™ products that were developed and released…. ·Worms™ Soundboard – a free iOS soundboard released on the App Store, for iPhone, on 15th April 2011. ·Worms™ Reloaded – a Mac OSX version of the best-selling game released on Steam on 18th May 2011. ·Worms™ Reloaded – x4 premium PC DLC packs released on Steam (Puzzle Pack, Forts Pack, Time Attack, Retro Pack) on 1st July 2011. ·Worms™ Special Edition – a streamlined, standalone Mac version of Worms™ Reloaded released on the Apple Mac App Store on 7th July 2011. ·Worms™ 2: Armageddon – x4 premium DLC packs (Puzzle Pack, Forts Pack, Time Attack, Retro Pack) released on Xbox LIVE Arcade and PlayStation®Network in August/September 2011 for Xbox 360 and PlayStation®3. ·Worms™ Ultimate Mayhem – an enhanced version of the classic 3D Worms™ games released on Xbox LIVE Arcade, Steam and PlayStation®Network on 28th September 2011 for Xbox 360/PC and on 14th/15th February 2012 for PlayStation®3. 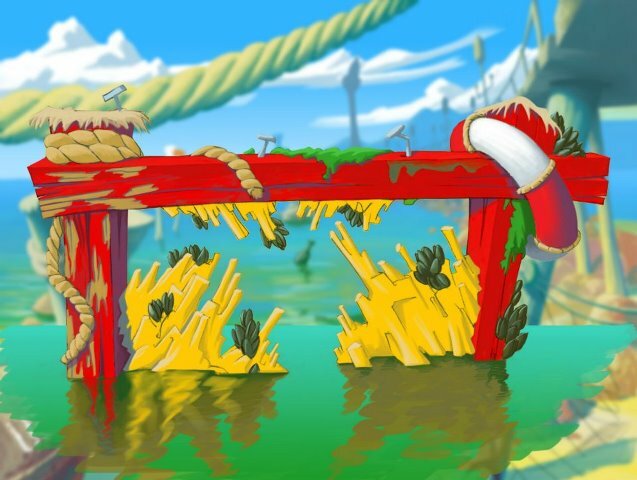 ·Worms™ Crazy Golf – a crazy 2D sports/puzzle game released on the App Store for iPhone/iPad/Mac, on PlayStation®Network for PlayStation®3 and on Steam for PC on 19th/26th October 2011 and for Mac on 8th December 2011. ·Worms™ Classics – x3 classic Worms™ games – Worms™, Worms™ Blast and Worms™ Pinball released on Steam for PC on 19th October 2011. ·Worms™ Ultimate Mayhem – x2 premium DLC packs released on Xbox LIVE Arcade for Xbox 360 (The Single-player Pack and The Multi-player Pack) on 14th December 2011 and 11th January 2012. All of these have been stellar performers with fantastic sales performance on all digital stores including Apple, Playstation Network (PSN) and Xbox Live Arcade (XBLA), amongst others. Additional developments to further drive this gameplay forward based on the huge growth in turn based gaming across the smartphone and social gaming market will see WORMS continue to dominate this genre of gameplay. There will also be a third element to this games development process in 2012 which has not been announced yet which will benefit all existing and future merchandise licensees. Where the merchandise is concerned we are discussing additional collectibles, role play, and trading concepts presently but this year will see a steady flow of additional merchandise coming to market including new T-Shirt Designs, plush collectibles, and resin figures among others. The image to the right covers the initial range of 6 resin figures that will be available later this year. There are others in development including some iconic “moves” from the fantastic depth of intellectual property associated with this fantastic game. Hugely collectible, customisable, and tradable which ultimately are key for merchandising success. The fact this game has been around since 1995 and continues to perform shows WORMS is here to stay and both existing and new fans have a game and brand that is built on very solid foundations. If you are interested in learning more about WORMS™ and what is coming next in both games and merchandising and you want to get involved, please contact us. We thought we would share some of the press coverage of the WORMS™ plush launch.